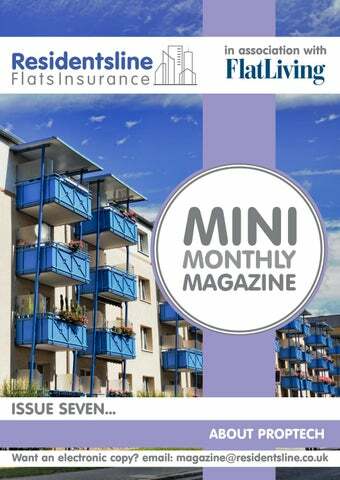 Flats Insurance We are pleased to introduce the seventh edition of our Mini Monthly Magazine. This month's issue is all about PropTech. Technology, Banking and Fraud - Have you considered the risks? For further copies please email us at magazine@residentsline.co.uk. To read a full copy of the latest Flat Living Magazine please visit www.flat-living.co.uk. We have taken Flat Living's monthly feature and have prepared it as a hard copy for you to circulate to your team. At Residentsline, we always aim to deliver the best for our clients. Our leading policies include cover for Directors and Officers, Flats Insurance, Lift Inspection, Legal Expenses and Terrorism, ensuring comprehensive cover at the most competitive prices. Our additional services include our Cloud-based portals: Manage Your Block and Property Management Portal, both of which allow clients to store and update important insurance information, as well as liaise with tenants and contractors. This month's edition of our Mini Magazine will be discussing PropTech: what PropTech is, how it can help and resources. We hope you find it useful, and please feel free to contact us with any questions â&#x20AC;&#x201C; we're always happy to help. Visit www.residentsline.co.uk to get a Quote. Although every effort is made to ensure the accuracy of material published in Flat Living Magazine, the publisher cannot accept responsibility for the veracity of claims made by contributors or advertisers. Contributors must accept full responsibility for the material they submit for publication to ensure that they do not infringe copyright, intellectual property rights or trademarks. Copyright for all materials published in Flat Living Magazine remains with the publishers. Any business advice given is for guidance only and readers must consult relevant bodies before acting on any advice given in the magazine. making massive strides in block management – which is a promising statement for the future of all involved in the property market. According to Estate Agent Today, Oxford University Professor Andrew Baum has compartmentalised this new era of PropTech in a few major stages – the first of which started with the emergence of limited technology as early as 1995. The second stage has seen the advancement of technology over the past decade, especially regarding how the Internet has affected property marketing and communication. Baum, in his analysis of PropTech, has estimated that we are currently facing the third stage, in which technological advancements will effectively dominate the entire industry. He predicts that this will come to a head in 2025/2030. He details the developments that we can expect in his essay 'PropTech 3.0'; incidentally, the first essay to be published on PropTech, so it's well worth a read. If FinTech (the bigger brother to PropTech) is anything to go by, then Baum will be correct in his estimation that technology will be the staple of the property market. Thus, as Baum advises, the first step is to be prepared. As intimidating as it sounds, this is a fantastic opportunity for property companies. The potential of growth that technology will bring to the industry will be momentous – but only if we make the effort to keep up-to-date with recent developments. Having investments of up to £39 billion to date, as well as providing opportunity for 8,000 new start-ups, PropTech has already taken massive strides in creating a more convenient and accessible property industry. How can this help you? In terms of property technology closer to home, here at Residentsline we have certainly been keeping up-to-date with technological developments. In recent years we have worked hard in developing our own software, tailoring it specifically to our customers' needs to make their lives more convenient. Our technology is designed for all types of clients - from agents and landlords to Residents' Management Companies (RMC) and freeholders. What is Manage Your Block? Manage Your Block is a web-based portal designed specifically for Residents' Management Companies. This is an exclusive system where we keep all your insurance documentation, to ensure they are kept safe and sound and copies can be obtained whenever you need them. Like our Property Management Portal, Manage Your Block is a completely free service, entirely exclusive to our clients. PropertyManagementPortal powered by Residentsline What is Property Management Portal? Our Property Management Portal has been designed specifically for landlords, property managers and freeholders – we know that these can be challenging roles, and so we wanted to create a platform to make it easier to manage documentation. It is a Cloudbased system exclusively accessible to our customers, and entirely free of charge. How can Manage Your Block help me? Manage your block is also available for non Residentsline clients to purchase for only £100 per annum. Many property managers purchase manage your block as a handy tool for their RMC clients. MYB is also available as an app enabling RMCs to alert their property manager of issues, for example, their lift is not working, a faulty light bulb or to make a claim. You can also view procedures and documents at one touch of a button. We're always searching for ways to be the best, and that applies to our property technology too. 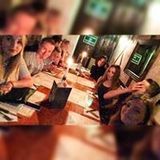 Residentsline are constantly developing so that we can ensure you have the best service and the most convenient experience when you choose to work with us. How can Property Management Portal help me? Property Management Portal is incredibly convenient way of helping you to handle your records. It will provide a safe and secure place for you to store, add, view or just download your insurance documentation, as well as keeping a register of your suppliers (such as gardeners and electricians) so you can access contact information with ease and even request quotes from your preferred suppliers for each block. Through the Portal, you will also be able to communicate with your residents and suppliers and keep them posted with any important news regarding the property. What could be more convenient? For more information, please contact Residentsline on 0800 281 235.
professionals who use our services. 4site's dedicated client portal aims to assist property professionals in their everyday work life by giving them access and control of their various safety reports. Clients can interact with and manage their reports, check their compliance score, view their properties and view what assessments have been undertaken at these properties. In addition to this, users have access to a library full of useful content in relation to health and safety requirements within the property industry. Compliance score The Compliance Score is an especially popular aspect of our website. Marked out of 100, the compliance score is generated as the closest indicator to the health and safety performance of a managed property portfolio. The overall score is created as a result of each property's individual compliance score; this is based on the data we have been provided with and have collected as a result of engaging with our service. The overall compliance score is clearly broken down and explained by a list of negative and positive aspects, providing a myriad of tools to assist with correcting any negatives. a section of the website dedicated to booking, completing and recording site inspections. It's free for any of our clients to use and comes with its own android application for using on-site! Site Inspection App The Site Inspection App is a free-to-use tool designed for our clients as an extension of the 4site website. The App allows property professionals who carry out site inspections to record their inspection, logging any required actions and capturing associated photos. The need to carry around a laptop is becoming less common, since many of the same applications can be accessed via phones and tablets. The Site Inspection App is beneficial in this way since the inspection will not have to be written by hand or on a laptop, and instead can be carried out via a hand-held device. “We've developed this with Property Professionals in mind and its use will have a double-edged benefit; our clients safety management responsibilities are simpler to comply with and so we can then report positively on this when visiting their properties” – Andrew Bull, Client Services Manager @ 4site Consulting Ltd.
LinkedIn, Twitter and Facebook and aim to share an engaging mix of informative content from both ourselves and professionals within the industry. Our social media platforms have quickly become a key way to share industry knowledge and educate those responsible for health and safety within their managed property. The rapid development of technology and Social Media has changed the ways in which we work, communicate and personalise the experience of those using our services and have helped us provide a more efficient operation as a result. Ultimately, the 4site Consulting web portal and Site Inspection App has been designed with the purpose of assisting property professionals with the ongoing health and safety management of their sites. By providing these to our clients for free, we hope they can be easily adopted and engaged with them which should accelerate them towards the ultimate goal, which is achieving compliance. For more information, please contact 4site Consulting on 01376 572 936. Have you considered the risks? Ailsa Burkimsher from Haines Watts Service Charge looks at the issues with technology, banking and fraud. In most cases the money involved is not recovered by the bank and is lost forever. How can you be certain you are paying who you think you are paying? Managing Agents and directors of RMCs make thousands of payments of service charge funds to suppliers each day. What can you do internally to reduce the risk? It's really important to train staff who are making payments so that they can be made aware of this issue and try to prevent such frauds occurring. What is the issue? A big issue is the increasing level of what the banking industry call Authorised Push Payment (APP) scams. This is where a bank customer authorises a payment to be made but have been tricked into using the wrong banking details either usually via email contact or sometimes telephone contact with a fraudster posing as your supplier. In order to decrease the likelihood of financial fraud it is sensible to have internal controls in place such as segregation of duties between staff members, i.e. different members of staff entering payments to be made onto the bank system from those who then authorise the payments. Consider requiring two bank account signatories to be needed to sign in to internet banking and approve payments. Ensure that systems are in place so that if you are authorising a payment you are certain whether you know whether the payee bank account number and sort code has been changed. There are also frauds where someone hacks into a managing agent's email and then strikes when a senior team member is out of the office, sending a fake email requesting an urgent online banking payment is made. Policies requiring that no payments are made without an in-person conversation or a telephone conversation are a good idea. IT security measures are important to try to prevent hacking of the email system. Have policies in place about what type of evidence you require from your suppliers before you change their payment details on your system. This could include requiring changes in writing on letterhead paper plus requiring that you phone the supplier direct to talk to them in person to confirm this change. Who can help externally? At Haines Watts we are well positioned to assist with a system review of your internal procedures to help minimise the risk of your finance systems being compromised as a result of advances in technology. We have experienced and professional teams with knowledge of system audit techniques and the property management sector. The work can be carried out as part of the service charge certification process or as a standalone project. If you are a director of an RMC consider having in place a Directors' and Officers' liability insurance policy in place which may protect you from personal financial liability. If you are managing agent, then consider whether your professional indemnity insurance covers you for this type of scenario. A typical fraud scenario A typical scenario for this type of fraud involves the fraudster hacking into for example a builder's email. The fraudster would then have details of works being carried out at the moment by the builder as part of a service charge. The fraudster would then email the managing agent/RMC bank account who will then quickly transfer the money and disappear with it. You may be wondering how these frauds work when surely the new bank account set up by the fraudster will have a different name to that of the supplier's name which you have used in the online banking system? Unfortunately, at present the names of bank accounts are not checked to bank data to ensure that they match the account number and sort code! Future Banking Industry Changes There is good news coming though as from the middle of next year a new system called 'Confirmation of Payee' will be implemented by the banking industry. This will mean that when setting up a payment of amending an existing payee the banks will match the data entered for the name of the person holding the bank account. There will be three difference scenarios: â&#x20AC;˘ If the exact bank account name matches, then the payment or change of payee details will be made. â&#x20AC;˘ If the name is very similar, then the actual bank account name will be revealed and can then be re-entered so that it matches. â&#x20AC;˘ Or if the name is completely wrong you will be advised to only proceed with caution. Make sure you review your internal procedures around banking payments and consider seeking professional help from an experienced service charge accountant. Always stop and think when making a banking payment. Am I certain this payment is being made to the correct supplier bank account!? For more information, please contact Haines Watts Service Charge on 0333 777 8131. AleĹĄ Ĺ petiÄ?, CEO and Founder of Klevio looks at how simple technologies can save managing agents time, money and stress. Whether you live in a house, flat, or bungalow, chances are that you have quite a bit of tech surrounding you to help make life easier, whether it's a timer on your coffee machine or a motion sensor for your security lights. With the growth of smartphone adoption, software is always at hand to help give you control over your environment. Quick messages using Whatsapp, Netflix offering entertainment on demand, Uber providing on demand point-to-point travel, Waze giving you directions and all the solutions in between, smartphones are empowering users to have more control over what they see, how they move around and how they communicate. This technology has also led to an explosion in property technologies (PropTech). People are looking for ways to manage their lives - and most of that management is on their smart devices. Monitoring the heating in your home with a HIVE setup or your water usage with Dropcountr. These tools are made to make everyday users understand and have control over what's happening in their homes. But, the real innovations to you, the managers, are being made with property management tools. We've moved our homes into the shared economy, with platforms like Airbnb and HomeAway. People are now hotel managers on top of their day jobs, and they want the same types of controls over their rental properties as they do their own dwellings. Multi-unit Management is the next evolution As disruptive technologies move into the mainstream, they become an expected offering. From companies having multiple channels to reach them like Twitter, email, phone and Facebook, to banking offering an app to manage your accounts, so to moves property management. This usually starts with the management of processes. Companies like FixFlo have made the administration of multi-unit management a lot easier. Tenants can add issues that need attention directly into the software and the landlord can then book a repairman to fix it, all within the app. This makes all the email communication back and forth unnecessary and saves time for all parties. If you look at a lot of the property management apps out there, one of the key selling points for all of them is the ability for instant, direct messaging between landlord and tenant - that is how they predominantly started. So, although people are wary of a lot of the PropTech solutions out there, they already use the forefather of it all. Think of these products as WhatsApp, but over time creators have added issue reporting, rent chasing, property searches and so much more to the service. But what about physical processes as opposed to digital ones? If you manage multiple rental properties or even a single apartment complex, you are looking to save time. Time on booking new tenants, paying rent, repairs, etc. are all things that are simple to change. Physically getting a repairman in the door though is still a hands-on experience for most people. Someone needs to be on hand to open the door for that person. The meet-and-greet lives on. Commercial adoption drives expectations When talking about expectations, you need to talk about adoption. If there were 100,000 people on the planet that used Facebook, you wouldn't expect that everyone you meet has a Facebook account. But with well over 2 billion users, you can be pretty sure that everyone you meet has an account. The same is true for commercial property technologies. Cardkeys became mainstream when hotels started to adopt them and people came to expect that technology, because they became familiar with it. Date: 11th July 2019 Venue: Croydon Conference Centre, Croydon CR0 1RG DELEGATE ACCESS IS FREE! Flat Living the Roadshow is designed for property management professionals Delegate numbers are strictly limited and we have opened booking so you can secure your free place now.